Teachers dedicate time to collaborate with both colleagues and students to improve practice, discover and share resources and ideas, and solve problems. Teachers dedicate planning time to collaborate with colleagues to create authentic learning experiences that leverage technology. I actively engage in monthly Twitter Chats where I connect with other educators who integrate technology into their instruction. I moderate the #ArkTLChat monthly. #ArkTLChat is a professional learning network geared towards library media specialists for the state of Arkansas (though we always have teacher-librarians and media specialists from across the country participate in our discussions). I regularly attend and faciliatate PLC meetings for each grade level with which I work. We discuss student progress and how we can work together as a team to ensure students are reaching academic goals. *This is an example document from a meeting as documents regularly contain sensitive student data and information. Teachers collaborate and co-learn with students to explore and experiment with digital tools and resources that support learning, and to diagnose and troubleshoot technology issues. I created this resource page for students to explore as part of our Computer Science class. Most links are hour of code activities that were curated to give students choice for their extra activities. Each week, I work with a different classroom to write, direct, film, and edit an episode of our weekly news program, Tiger Tales. Students are divided into groups and assigned the regular tasks of a news team to produce the episode. Teachers use collaborative tools to engage virtually with experts, teams, and students, locally and globally, to expand students' authentic, real-world learning experiences. During Learning with the Internet, I collaborated with classmates to present tools which teachers can use to encourage collaboration in their classrooms. I also collaborated with others to create a list of collaborative resources that teachers can use to promote meaningful learning in their classrooms. 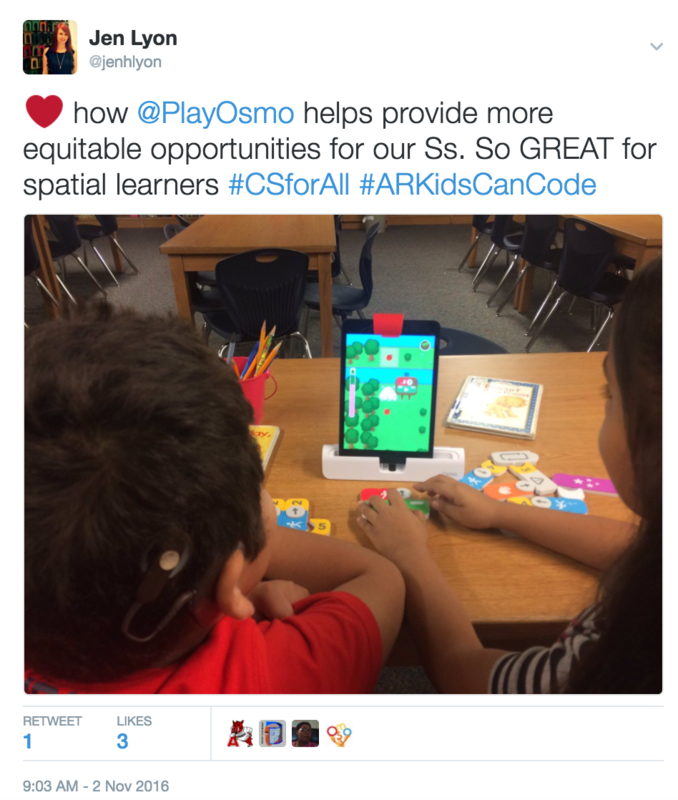 I regularly post on Twitter using #ARKidsCanCode, our official state Computer Science Education hashtag. This presents me with the opportunity to not only demonstrate the community of coders I have built in my school but also reach out for collaborative opportunities with other Computer Science educators in Arkansas. This photograph is of students in my hearing impaired class playing Osmo and learning how to write algorithms. I have participated in Google Hangouts and Skypes to give students real-world examples of our work. One example is a Google Hangout that was lead by Hadi Partovi, founder of Code.org. Students were able to discuss the importance of computer science education with him. He also facilitated a discussion with students about the real-world careers students could pursue.